If you haven’t heard about Red Dead Redemption before than shame on you! Seriously if you haven't, I strong suggest you read our XBox 360 review by clicking here to know what a fantastic game you are missing out on. Just to summarise the game, it revolves around John Marston, a former outlaw turned bounty hunter who rode the lands of the Wild West. Although it had some parallels to Grand Theft Auto, it was still its own game that received a well deserved 10 out 10 from Impulse Gamer. Nonetheless, it received amazing scores in both in the gaming community and those pesky gaming critics. 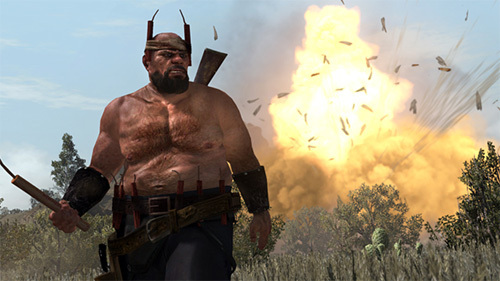 As gamers across the world enjoy the single player campaign and online skirmishes, Rockstar have released their first paid pack for XBox Live, entitled Legends and Killers that introduce a couple of sharp (Tomahawk) surprises for the player. It should be noted that this will be the first of four paid DLC’s made available to the gaming public. Once downloaded, the first thing you will notice in the game are the new characters and interestingly enough, these are from the Red Dead Revolver, the precursor to Red Dead Redemption which includes characters such as Red Harlow and Ugly Chris. I must admit that this was a blast using these characters in the Red Dead Redemption universe and although it didn’t anything new in terms of gameplay, giving more choices to the player is always a step in the right direction. Especially ones who look like they have walked out of a Clint Eastwood Spaghetti Western. 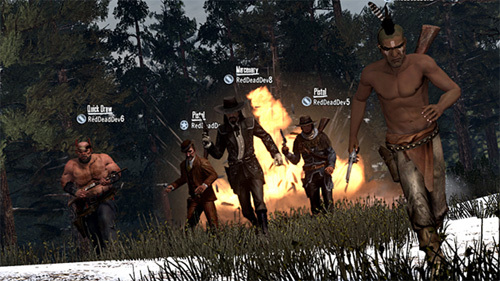 Legends and Killers contain a variety of new gaming environments that increase the arsenal of online players which throw sa few twists and turns into your strategy such as Tall Trees and Blackwater. Blackwater is my favourite area in Legends and Killers and is a medium sized town that has lots of nooks and crannies to hide in. However in order to master this area, we suggested the rifle, especially if you find a nice little camping spot. Tall Trees on the other hand is a dense forest that really puts you on edge as you attempt to dodge bullets and tomahawks as they whiz by your head. Other areas included are Thieves Landing, Fort Mercer (another cool one), Manzanita Post, Punto Orgullo, Escalera, Hennigan's Stead and Rio Bravo which contains a really cool Gold Rush experience. We do realise that these maps do come from the single-player campaign and free roam modes but adding them to multiplayer experience now lets online gamers experience the joys of these impressive sights. Multiplayer modes that can be played on these maps include Gang Shootout, Gold Rush, Grab the Bag, Hold Your Own and Shootout. Not all modes can be played on all the maps and once again Grab the Bag is still the most intensive mode which in essence is capture the flag. There are even some great new trophies to aim for in this new multiplayer experience such as Reeeeal Good, get 25 dynamite kills as Pig Josh (Red Dead Revolver) or Hail Mary which requires you to get a kill at 35 yards or more with a Tomahawk... very difficult. In terms of weapons, Rockstar have included the tomahawk in this pack which for us gaming sadists, is the definitely the highlight of the game, especially because it can be used quite stealthily and also for a few of the challenges. Whether you’re engaged in melee combat or decide to use it as a throwing axe, the tomahawk is definitely a multifaceted weapon of choice. Gatling gun versus the tomahawk? You’d be surprised how these fights end. Graphics and sound also compliment this DLC well but because these two areas were pretty much perfect in Red Dead Redemption, don’t expect any changes here. It's still one of the most impressive sandbox games in the last few years. Pig Josh never looked sexier! 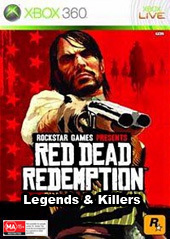 At the end of the day, Red Dead Redemption: Legends and Killers is a worthy purchase to those gamers who enjoyed the current maps and free add-ons by Rockstar. 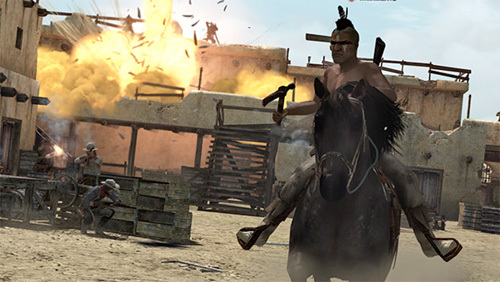 With lots of new areas to explore and of course, the tomahawk, this add-on guarantees another thoroughly enjoyable Red Dead Redemption experience and if you buy it now, you might get a little practice in before everyone else jumps on the Western bandwagon. Before I go, it should be noted that if you install this add-on, the Tomahawk can be used in Free Roam and Single-player as well which makes for some interesting gameplay. Some may find the price a little steep, considering that it’s multiplayer only but because the multiplayer aspect of the original game was so well designed, this add-on in our opinion is worth every penny.